Today every house has gutters and sometimes gutter guards. Many people do not realize how important gutters are. Fully functional gutters not only drain the rain water, but protect the wood Fascia behind the gutter and the walls of the house. Many times the damaged or clogged gutters were the cause of the window leaks and rotten wood on the house. 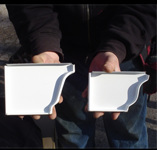 We can offer you to install 5K or 6K Gutters, the difference is in size. Most residential houses have 5K Gutters on, more and more people prefer to install 6K Gutters, because they are wider and deeper, this way can drain faster more water preventing overflowing and clogging.